Our mission is to design, develop, and manufacture the best environmentally specific Conservatories, Greenhouses, Sunrooms, Pool Enclosures, and Skylights in the world. We analyze our customers' expectations and combine their ideas with our technology to create the ideal environment. Our architectural innovations have the ultimate goal of creating long-lasting structures, which are the perfect blend of design and purpose. We offer very high quality Custom commercial glass greenhouses and Residential glass greenhouses, Hobby glass greenhouses, Conservatory and Sunrooms, Spa and Swimming Pool Enclosure and Retractable Skylights. Commercial & Residential Spa Enclosures. Conservatories: Nothing can surpass the charm and beauty of classic English conservatories. With elegant lines and exquisite detail, conservatories are the ultimate extension between your living space and the environment, providing a functional sanctuary with unparalleled beauty. We offer the most complete selection of decorative elements in the industry, including extruded moldings, gutters, ridge cresting, and finials. They create exquisite detail that previously was only available in all-wood conservatories. Our conservatories are not limited to all-aluminum designs. We also offer aluminum exterior/wood interior options featuring solid Mahogany or laminates of Southern Yellow Pine, Western Red Cedar, and Douglas Fir. Other woods, like Redwood, Cherry, or Spanish Cedar, can be integrated upon request. The advanced design of our aluminum glazing system isolates the moisture from the wood, preventing water damage. The virtually maintenance-free aluminum exterior protects the delicate interior wood from environmental extremes. 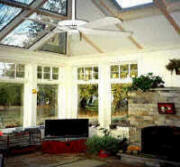 Sunroom: Sunroom Designs provides an unmatched experience that combines indoor comfort with views of the outdoors. We match glass panel sizing, pitch, colors and accessories to, depending on the wishes of our customer, create a unique focal point or seamlessly blend into the surrounding architecture. In fact, we do not think of ourselves as selling only a sunroom; rather, we help to design an environment which is the perfect blend of design and purpose. We offer numerous standard colors (including White, Bronze, Hartford Green, Natural Clay, Black, Sandstone, and anodized finishes), as well as many types of decorative and high performance glass. Solar Innovations provides a variety of options for any decorative and functional need. Skylight: Skylight design and structural integrity to levels far beyond the competition. Our skylights come in virtually any color or style and are available in both our aluminum and wood system. Open up any room by incorporating natural overhead lighting with skylights by us. We have virtually any type of skylight imaginable: roof lanterns, residential, commercial, and institutional applications. Designs range from simple single slope skylights, otherwise known as roof windows, to double pitch, segmented barrel vault, true radius dome, to curb mount, pre-glazed skylights in various configurations. We also offer 7" wood system skylights, consisting of solid wood or wood laminate interiors and maintenance free aluminum exteriors. Our skylights are available in solid Mahogany or Spanish Cedar. Upon special request, interiors can be finished with laminates of Western Red Cedar, Southern Yellow Pine, Douglas Fir, and Northern White Pine (straight eave skylight applications only). Redwood and Cherry may be integrated into your skylight depending on final engineering requirements. Spa & Pool Enlosures: Take Control of the use of your pool or spa, with our Pool and Spa Enclosures. Our advanced-formula thermal breaks create a barrier between your enclosure and the outside world. Various glazing options allow the charm and beauty of Mother Nature to come in, while keeping out snow, wind and rain. We use a non-corrosive aluminum framework and stainless steel fasteners, which stand the test of time in the high humidity, chemical filled environment of a pool or spa enclosure. Efficiency-enhancing ridge vents, doors and windows allow for proper ventilation and climate control, and our gaskets are made of a special non-shrink core that minimizes leaks and air infiltration. Our double-paned, insulated glass is 1" thick vs. the competition’s 7/8" thick design (a 14% increase in depth for added efficiency), and our 3/16" glass measures 50% thicker than our competitors’ 1/8" glazing. These thermally broken design specifications add up to increased R-values while simultaneously decreasing U-values. Our Products come in any size, shape or color. These custom designed systems are priced comparably to our competitors’ standard offerings. We can meet any wind or snow load requirement, and we offer high-performance tinted glass or polycarbonate. That, combined with a 10-year warranty on all extruded parts, makes Solar Innovations the obvious choice for any decorative or functional need. Residential Custom Room: You can experience the natural beauty of a sunrise or sunset in year-round comfort. Bring in the sun, moon, and stars with an investment that will stand the test of time. Our manufacturers aluminum and wood structures in standard and custom configurations. Our customers can choose from numerous standard colors including White, Bronze, Hartford Green, Natural Clay, Black, Sandstone, and Mill finish aluminum. Clear Anodized, Dark Bronze, Anodized, and custom color finishes are available for an additional charge. We also offer a large selection of glazing options, including some of the highest performance combinations available. Our products are not limited to all-aluminum designs. We also offer aluminum exterior/wood interior options featuring solid mahogany or laminates of Southern Yellow Pine, Western Red Cedar, and Douglas Fir. Other woods, like Redwood, Cherry, or Spanish Cedar, can be integrated upon request. The advanced design of our aluminum glazing system isolates the moisture from the wood, preventing water damage. The virtually maintenance-free aluminum exterior protects the delicate interior wood from environmental extremes. We offer everything from horticultural houses to Victorian-style greenhouses to Grangerizes. These structures range from simple lean-to or double pitch options to the most ornate. In addition, commercial greenhouses for schools, universities, and businesses around the world. These greenhouses can incorporate accessories and create independent environments for research and experimentation. 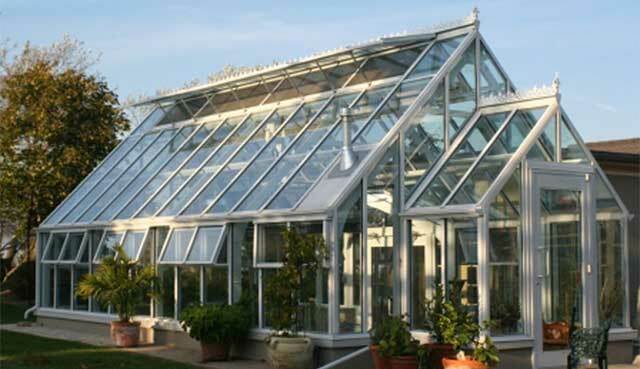 Whether you are looking for a contemporary greenhouse, an English or Victorian greenhouse design, or even a restoration concept, we will build the structure of your dreams. Contact our experts who will help you from the design to the final installation of your custom greenhouse structure.